Exactly what is a marine travel lift? People unfamiliar with this particular crane may be curious about this issue. 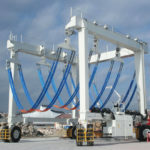 The marine travel lift is a sort of non-standard crane widely found in harbors and dockside to handle small to large vessels. It is able to support a considerable amount of weight, usually going up to 1200 tons. 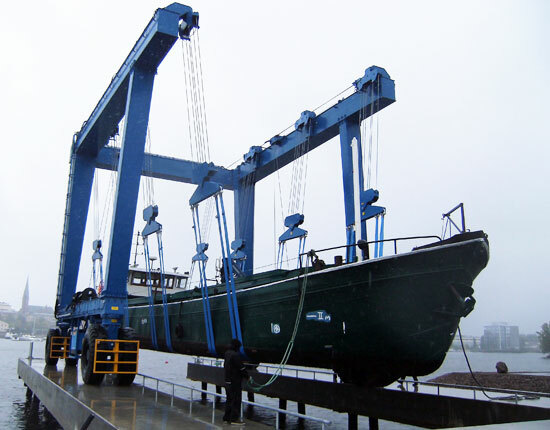 The marine lift can perform the lift-in, lift-out and transportation of boats in order to fulfill the requirements of maintaining, repairing and launching of vessels as well as arranging the ships in the limited yard space. The marine travel lifts can be built to accommodate a range of vessel sizes and weight. It makes the hauling of a boat convenient and effortless. 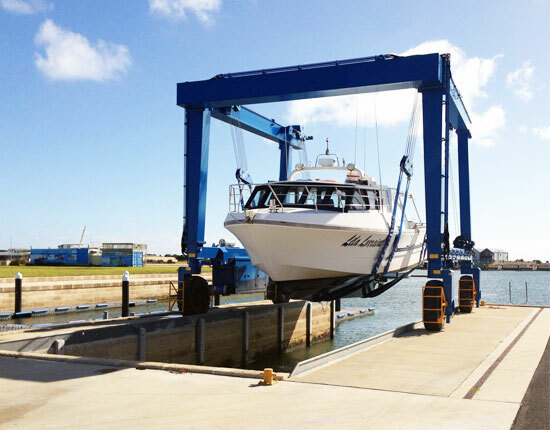 The marine boat lift produced by Ellsen factory is capable of handling a range of vessels, such as yacht, sailboat, powerboat, shipping boat and wooden boat. 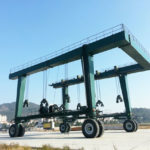 According to the lifting capacity, the marine lifts can be classified into 10 ton, 20 ton, 50 ton, 100 ton, 200 ton, 300 ton, 1000 ton marine travel lift and beyond. 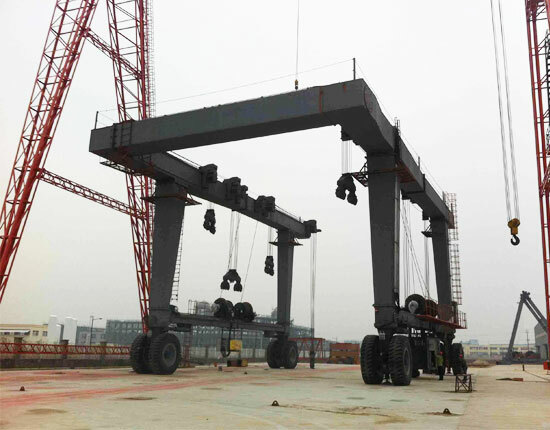 According to the power source, they can be divided into hydraulic boat lift and electric boat hoist. Each type and configuration is meant to meet your specific lifting needs. The travel lift marine for sale from our company is built with high stability and long working life. As one of leading marine travel lift manufacturers and suppliers in China, we always provide quality products, factory price and dependable services. To learn which type of marine travel lift is right for your application, contact Ellsen customer service now! 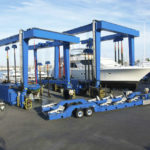 What Are The Typical Uses of Marine Boat Lift? The marine travel lift boat hoist can be put into use for small to large tonnage boat handling. These heavy duty vessel handling equipment are engineered for the effortless, safe and economical transportation for customer’s sailboats, yachts, fishing boats, powerboats, tugs and other work boats, widely employed in harbor, shipyard, yacht club, water recreation center and so on. The marina travel lift delivers a few main functions on the shore, including the lift-in operation (launching of boats), lift-out operation, transportation of ships in the yard areas. The boat crane designed and manufactured by Ellsen is meant for the utmost reliability, productivity and safety of dock operations. To get affordable marine travel lift prices, email us now! How Does The Marine Travel Lift Work? Incorporating a number of simple mechanisms and units, the marine boat travel lift offers great power for boat hauling. It is mainly composed of the metal structure, wheel group, hoisting mechanism, hydraulic system, steering system and control system. The metal structure is the basic unit that supports the weight of loads and the components of the crane. It is designed and constructed to guarantee a prolonged working life. 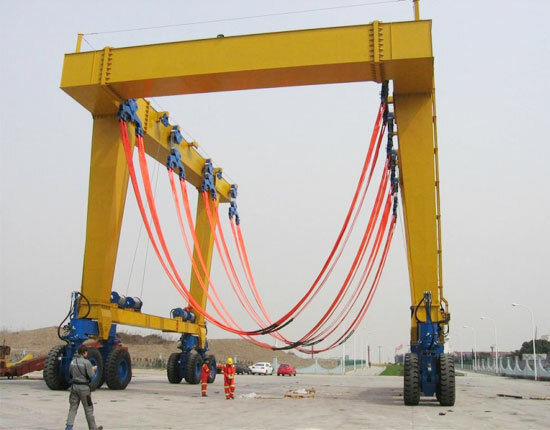 In terms of hoisting mechanism, travel lift slings are the units that are positioned underneath the ship, and they are aligned vertically with the lifting points. In addition, all the lifting points will be raised high enough to clear from supports or any obstacles along the lifting path. While in the transportation process, they will be lowered to near ground level as much as possible. In regards to the operation and steering system, there are a few modes that can be applied for the marine lift travelling, including straight travelling, oblique travelling, fixed axle steering, 90 degree steering, Ackermann steering and so on to meet different working conditions. The mobile boat lift can also travel with maximum slope up to 4% when fully loaded. The steering mechanism is powered hydraulically. Hydraulic transmission system is commonly applied for the movement of the entire crane. According to customer’s requirements, we can also design electric transmission mechanism for the small tonnage marine travel lift. 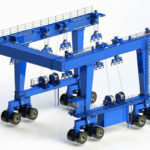 How to control the marine lift? Basically, there are two main styles, remote control and cabin control. The remotely controlled boat lift is commonly found in a variety of fields since it is more economical than a driver’s cabin. Whereas cabin controlled mobile boat hoist is more often applied for large tonnage boat hauling requirements. Once accomplishing the lift-in and lift-out work, the marine travel lift should be parked aside for the convenience of water drainage. How Much Does A Marine Travel Lift Cost? 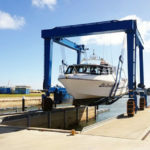 The cost of marine travel lift is one of the major considerations of clients in their boat lift selection process, which is largely determined by the required specifications and configurations, such as the lifting capacity, size, span and lifting speed. 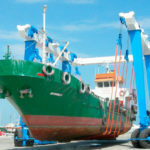 Boat hoist lift is regarded as a cost-effective and powerful solution for vessel handling on the shore side as it provides the utmost efficiency, safety and economical benefits for the operation of docks and harbors. The marine travel lifts supplied by Ellsen company have reasonable costs, good quality and long service life. They are ideal for your cost-saving requirements. To get a free quotation, call us today! For most marine applications, the machine should be designed and built to withstand harsh marine environments such as corrosive salt-water. Working near or in a body of water, the marine travel lift calls for specific design and construction to better protect the crane. galvanizing the steel will effectively prevent it from corroding in salt-water environments. Use stainless steel motors and components for excellent corrosion resistance in the harsh marine environments. The use of superior primer and top coat will better resist corrosion. Use rigid beam formed structure for a longer working life. To ensure the safety of the equipment and personnel, the travel-lift operator should follow operating procedure. 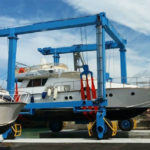 Here are some tips for the safe use of boat lift crane. Conduct a pre-lift check, such as checking engine oil level, slings, tires, wire cable and other crucial components. During lifting, the personnel in the working area should be restricted to those who are responsible for the lifting operations. At least two persons are required for lifting operations, an operator and a coordinator so as to achieve a safe and efficient lifting. The vessel to be lifted should not exceed the rated lifting capacity. In harsh environments like strong winds, no lifting operations should be performed. The marine travel-lift should take a periodic inspection and maintenance to make sure it is in a good working condition as well as to prolong its working life. To know more about marine travel lift and safe operations, please fill in the contact form below to tell us your requirements.